VORTEX™ is the newest evolution of pre-workouts. Compounded and engineered with three unique new ingredients that have been carefully formulated to enhance and intensify the quality of your workouts. Leave your old pre-workout behind - No more unproductive time in the gym - Hold on tight and prepare to enter the Vortex - Unparalleled workouts lie ahead! This is not a VORTEX™ sequel. This is our strongest floor-to-ceiling, all eyes forward, training powder. There is nothing else out there that will ever make you feel this way - Faster, Stronger, Harder than anything else you’ve ever tried. Flip the switch and train with VORTEX™. USE ON TRAINING DAYS ONLY. PLEASE BEGIN WITH ONE SERVING (1 SCOOP) TO ASSESS TOLERANCE LEVEL BEFORE PROGRESSING TO TWO FULL SCOOPS. Take one (1) serving (1 scoop) approximately 15-30 minutes prior to training, blended into 6-8 ounces of cold water or beverage, or as suggested by a qualified healthcare practitioner. IMPORTANT NOTE(S): Do not exceed two (2) servings (2 scoops) in a 24 hour period. 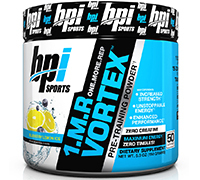 Avoid eating food or drinking a protein shake within an hour after consuming VORTEX™. To avoid sleeplessness, do not take within four (4) hours of bedtime. Taking VORTEX™ with food, or on a full stomach, may diminish its effects.